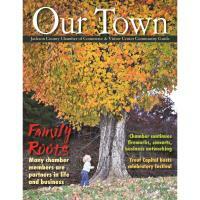 The Jackson County (N.C.) Chamber of Commerce published its 13th annual “Our Town” magazine on Jan. 30. The 44-page community guide shines a spotlight on the many wonderful businesses, events and communities of Jackson County. Four years ago, the chamber brought publishing the magazine in house, for the purpose of using the additional revenue for July 4 fireworks and Concerts on the Creek. * Our scenic outdoors, including waterfalls, hiking trails and more. * Plus, advertising by our many chamber businesses and partners, as well as a chamber directory of all members. “The Our Town magazine is a valuable relocation tool for people moving to the area, as well as an excellent advertising opportunity for our member businesses and partners,” added Spiro. “Thousands of these community guides are distributed each year. Our Town is available to view online HERE. To order a free copy visit www.mountainlovers.com and then hit “request information” or call the Chamber office at 828-586-2155.